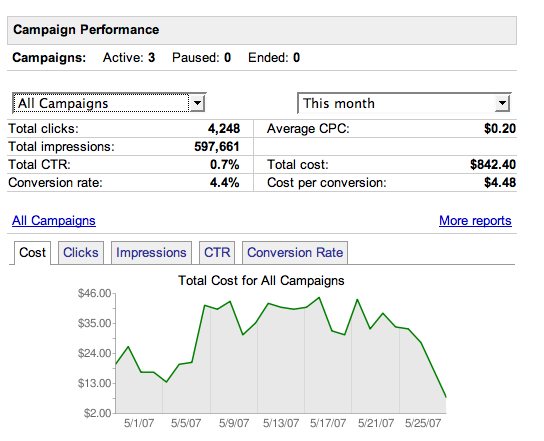 The Google Adwords Account Snapshot feature has been available in some of my Adwords accounts for several months. I noticed it again today and thought it would be interesting to show what type of click activity it takes to generate results in an average Google Adwords account. As you can see, this account has generated 188 sales so far this month at an average cost of $4.48 per sale. This entry was posted on May 27, 2007 at 7:56 pm and is filed under Adwords, Adwords Account Snapshot, Google Adwords. You can follow any responses to this entry through the RSS 2.0 feed. You can leave a response, or trackback from your own site.